Former Matador folkie hits the road with the guy who gave us Two Dollar Guitar. 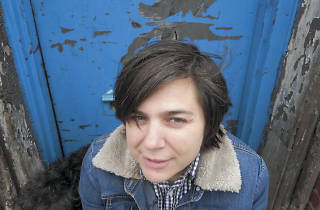 Brooklyn songwriter Jennifer O’Connor’s currently at work building up the roster of her own imprint, Kiam Records, but not so long ago she boasted the honor of being one of few female artists in the traditional singer-songwriter mold signed to indie imprint Matador. Chalk it up to coincidence that her voice conjures memories of Liz Phair’s early days, at least when O’Connor wallows in lower registers. Her latest, I Want What You Want, vacillates between somber folk meditations and supple if spare guitar pop, often transcending its sad-sack roots, capturing a quiet intensity with an unvarnished approach. If the melodies are familiar, the stories inhabiting them often aren’t. The relatively peppy “Running Start” finds O’Connor running through the refrain, “You don’t know anything at all,” delivered with enough of a hook to mask the defensive nature of the statement. For this tour she’s joined by Tim Foljahn, a fixture of the NYC scene whose countless credits include stints with Cat Power, Townes Van Zandt and Two Dollar Guitar. Foljahn’s Songs for an Age of Extinction, also released on Kiam, is a Wurlitzer-brushed canvas for his unhurried, ornamental guitarwork, awash in psychedelic tones, a solid reminder of why he’s been tapped by so many talents.